This one is so easy that it barely needs it’s own post. It might seem like a strange combo of flavors but trust me, this will become your favorite summer salad! 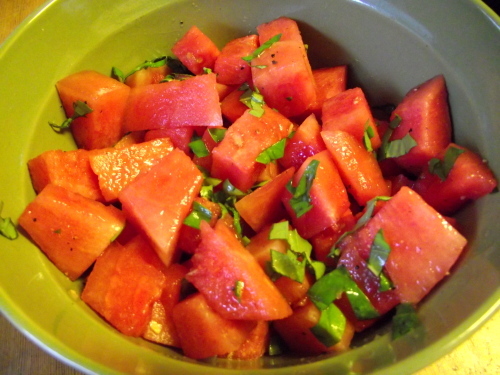 I use white balsamic so that I can keep the bright contrast of the red watermelon against the bright green basil but dark balsamic will work just as well. Cut that watermelon into bite sized cubes, dice up the basil and put them both into a large bowl. Sprinkle with salt & pepper and pour in balsamic and then mix well. Let it chill for at least a half hour before serving.